In this new year, as The Coconut Latitudes branches out into the world, it continues to bring some unexpected gifts and connections. The latest arrived yesterday, when, out-of-the-blue, a message arrived from a pen pal who I corresponded with more than fifty years ago. The first gift was the arrival of photographs I’d never before seen. They were taken in the 1950s in Miches by a German family who visited my childhood home. The photos let me suddenly see my family from another lens. Heinz Neumann, in his early 20s then, but now in his early 80s, discovered the photo that is the cover of my book (bless the internet!). He contacted me to see if I was indeed the child he knew so long ago and far away. 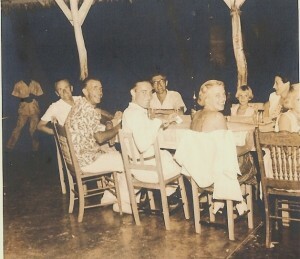 One of the pictures he sent shows Heinz as a handsome young man seated between my parents in a rustic thatched-roof bar in Miches. And there I am, a six-year old, uncomfortably perched on a chair across the table, dwarfed by the drinking and partying adults. 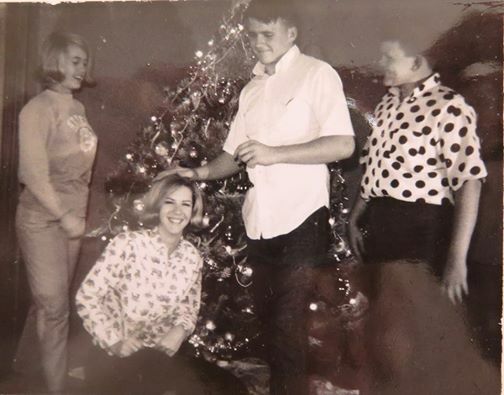 Though I recalled seeing this picture as a child, I’d never known who the strangers were – and now I get to know their story and how it intertwined with mine. Heinz has sent me many images and each is a new discovery—until now, I had only a few pictures of that era. 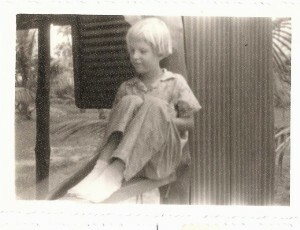 It is a peculiar feeling to see myself as the child I wrote about in the memoir. As I viewed them, I felt protective and tender towards my very young self; I wanted to reach out through the years and reassure her that her life would, someday, get better. The second present was even more surprising. 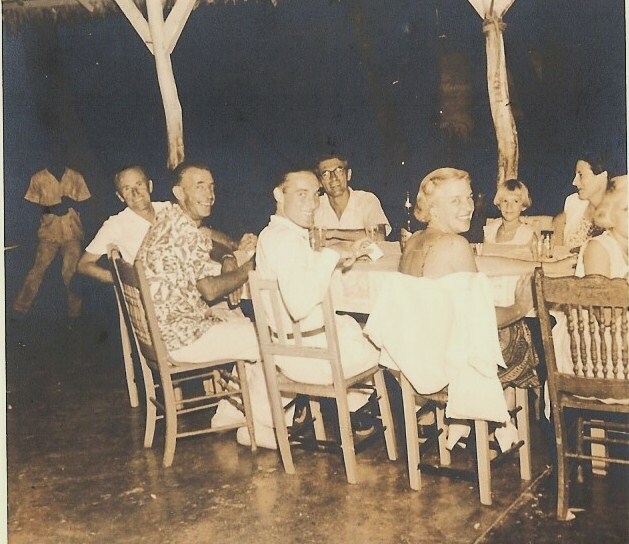 Through Facebook, I connected with Joan, the daughter of Carlyle Sees, my father’s former partner in the coconut business. As readers of my book may recall, early in our new island life this partnership dissolved painfully. My sister and I were forbidden to speak to the Sees children, a boy and girl my own age. My father even planted a high hedge between our properties. We never spoke to them again in our years on the island. Fast forward to 2015. Not only am I now “speaking to” my former friend electronically, she’s sent me her father’s autobiography, which included his side of the coconut farm saga. Again, like Heinz’s photos, a new/old world opened up to me—I had another perspective on our unusual life story. The third gift was a recent reconnection with a key person in my life—my college friend Ellen. Her family rescued me from a disastrous living situation in Florida. Living with Ellen and her two brothers, Bill and Jim, I experienced my first Christmas away from home, in the emb race of her family. This was my first experience being around loving, open-hearted adults and teenagers who actually felt free to speak their own minds without repercussions. It was truly a life-changing experience for me, and almost fifty years later, we have much to catch up on. I get to say thank you to Ellen for the gift she and her family were to me. However painful, emotional, or exciting these connections have been—they are part of this new year of life after publishing my memoir. As The Coconut Latitudes continues its journey in the world, I have no idea what other gifts it will bear—but am thankful for these offerings, and am already a changed person for it.